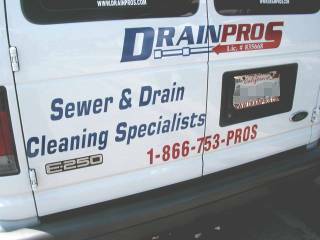 The first thing you notice about DrainPros -- a Lakewood-based, locally owned, full-service plumbing firm specializing in clogged drains -- is their website. 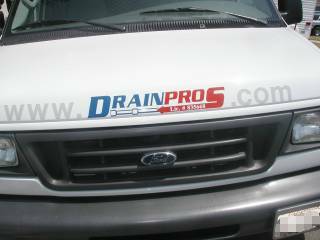 DrainPros proudly displays their website -- www.drainpros.com -- on their service truck. And workers also have the website emblazoned on their shirts. Like like their wesbite, their work is user-friendly and pro. 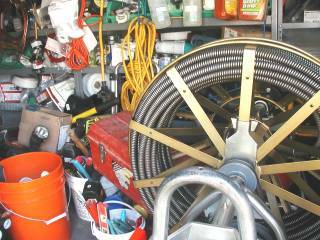 DrainPros isn't just a firm with a rooter. 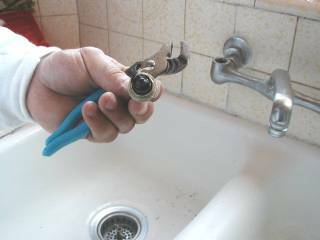 They're a full-service plumbing firm that specializes in opening clogged drains. 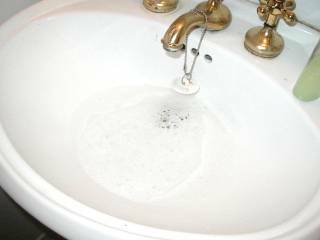 ...where Mrs. LBReport.com has been nagging us about a bathroom sink not draining (photo). 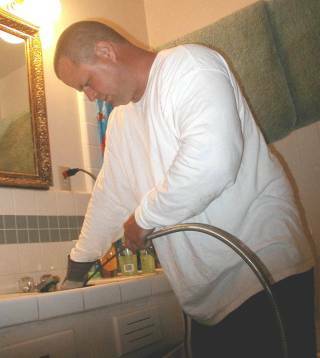 DrainPros agreed to let us take pictures of them in action and report what took place as it happened. DrainPros arrived on time...and they were ready to go. 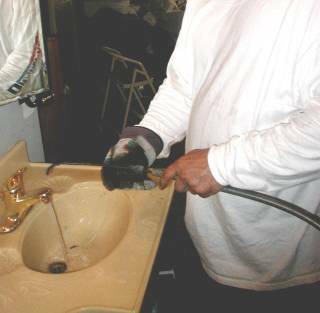 Owner Randy Lockridge quickly freed up the first slow running bathroom sink. Using a compact eletrically powered snake, they had the first bathroom sink running freely in about three minutes. The second bathroom sink was running very slowly. Running the water for a few seconds quickly produced a lake. That sink is across a wall from a bedroom vanity with a parallel sink that was also stopped up. Some plumbers hate dealing with setups like this because they can be a nuisance to free up. DrainPros got right to work. It took a bit longer than the first sink, but they got both drains running...and they didn't create a mess. As for the leaky kitchen faucet, they had the right washer and seat with them...and no, they didn't try to force the handle off. They used the proper tools and had the job done right in a jiffy. As they say, they turn "nightmares into pipedreams." 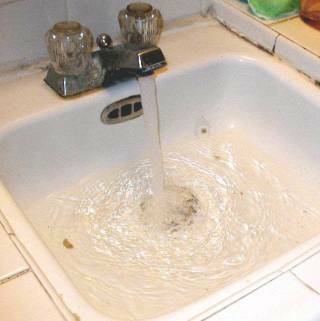 And they come equipped to do bigger jobs too including leak detection, copper repipe, gas line repairs, plumbing remodeling, sewer line installation, hydro-jettin, line location, slab leak repair...and water heater relacement. Cleaning drains is their specialty...and their website has a discount offer: click on their "drain club" (of course, it's at www.drainclub.com") and you when you get five drains cleaned, the sixth one is FREE! They offer special deals for return customers, and provide apartment management service agreements too. And they say www.drainpros.com brings them calls beyond LB and Lakewood; they handle clogged drains and other plumbing work for properties from OC to LA. Check out drainpros.com...and see what a smart, locally owned, internet savvy firm can deliver. 1-866-753-PROS [1-866-753-7767] or (562) 753-4149. Above text compensated advertisement. Representations from advertiser. Copyright © 2005 LBReport.com, LLC. All rights reserved.